LOCAL HEROES. A tribute for Remembrance Day 2017. Whilst in no way denigrating those who rightly deserve to be called modern day heroes, it can sometimes seem that this title is nowadays conferred a little too lightly, especially by tabloid newspapers in search of a headline. When I went into the Star Inn as a young man sixty years ago, a majority of the men in there could have been said to be heroes but would have made no such claim. They were from a time when everyone “did his or her bit”. Four men could regularly be seen playing cards together. During the Second World War 1939-1945, one had been a navigator on Lancaster bombers, one had landed on the beaches at Anzio in Italy and fought his way through to Germany via Monte Cassino, a third an RAF pilot four years in a prisoner of war camp returning home half his normal weight and a fourth had been an anti-aircraft gunner in Malta. The latter island had been heavily bombed by the Luftwaffe on a daily basis. When others went to the shelters he had to stay at his post. He said little about it but I vividly remember that when he lit a cigarette, the hand holding the match would shake so violently he had to clench it with his other hand. At that time a veteran of the Great War who had lost a leg limped daily to the Manor where he worked as a gardener. He was always smiling with a kind word for everyone. I plucked up the courage to ask him about it. “Ah well, you see”, he said “I only lost a leg and many of my comrades lost their lives!” A local lad of barely eighteen, newly enlisted in the Wiltshire regiment, went up to the front before the Battle of the Somme. 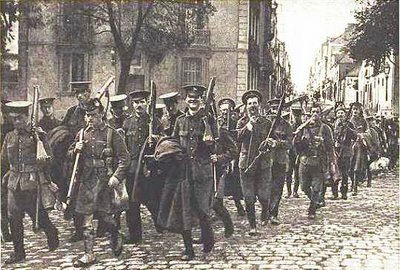 The soldiers told him that WILTS stood for “Will I live til Saturday?” He returned home badly injured but 20,000 of the men who were with him that morning didn’t live to see the sun set, let alone living until Saturday. At this time when we stand in silence to remember those who didn’t return, we should also spare a thought for those who served and returned, often suffering mentally or physically, but are no longer with us. I therefore set out on the next page the stories of two local men, one who returned from the First World War and one from the Second. Horse drawn limber used during the First World War for taking shells, ammunition and supplies up to the front line. The third battle of Ypres, often referred to as the battle of Paschendaele (a small village a little North East of Ypres), took place 100 years ago. 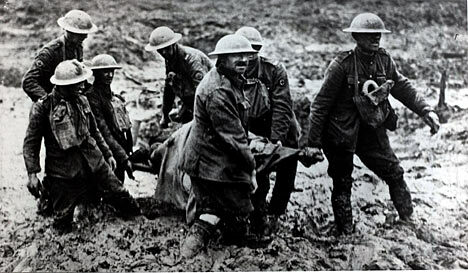 Although it didn’t last as long as the Somme battle in 1916, it was just as bloody and even more muddy. Soon after the start, on July 31st 1917, the rain began and kept on! With the ground churned up by many thousands of shell bursts, which also destroyed the drainage, the battlefield quickly became a quagmire. My father, George, was a horse drawn limber driver in the Machine Gun Corps, delivering ammunition and other supplies to a squadron of 12 Vickers guns which could easily fire off a quarter of a million rounds of .303 ammunition on a “busy day”! His was often a hectic and hazardous occupation as movement near the front, if observed by the enemy, would bring at least a few “whiz-bangs”, mortar shells from a ‘Nebelwerfer’ – a heavy trench mortar. Depending on the terrain it was often possible to approach the front only under cover of darkness. Soon the travelling near the front became so bad that the limbers had to be abandoned and all supplies moved up by packhorse. The limber drivers each rode one horse and led another carrying panniers. To walk leading two horses would have been too slow as journeys could not have been completed during darkness. Often considerable detours were necessary to avoid the worst of the morass. Actually on the front line, miles of duckboards were laid to give a good footing for the troops. 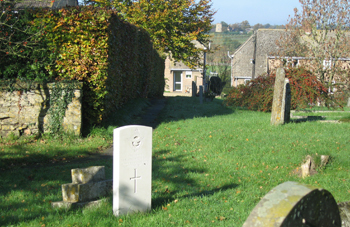 Woe betide the soldier who slipped off the walkway into a shell hole – often never to be seen again! Photo of the dreadful ruined landscape of Paschendaele, with supplies being taken up to the front line by limbers and pack horses. On one occasion, George was delivering 18 pounder shells to an associated Royal Field Artillery battery near his squadron. Arriving back at base from his journey he was given a mug of rum and two fresh horses, one laden with shell fuses as insufficient had been sent with the shells. He was ordered to go as fast as possible to the battery – it would be getting light as he arrived – and to stay there under cover next day, returning at night. Despite attracting a number of missiles on this trip, he arrived safely and all was well. The battle of Paschendaele concluded on November 6th when Canadian troops captured the completely ruined village – hardly one stone standing on another. And so on to CAMBRAI, the first ever battle where tanks were used in force, the British Army had almost 500 of them, the enemy almost more at this time, but that is another story. Frank Riches was from Culworth but was frequent visitor to the Star Inn, Sulgrave, in the years following the Second World War. I can picture him now, on his favourite stool at the bar where his son Guy (a “spitting image” of his dad) is now to be seen from time to time. I am indebted to Guy for the information contained in this account. Frank was a regular soldier before WW2, serving in the 4/7 Royal Dragoon Guards. Stationed in Aldershot, his regiment was ordered to France two weeks after the outbreak of war on 3rd September 1939. He was evacuated from Dunkirk with the surviving British troops on 3rd June 1940. His regiment was drafted to the Middle East in 1941. He served in both the Long Range Desert Group and the Special Air Service, operating in the desert behind enemy lines to harass Rommel’s German Africa Korps communications. His life took a dramatic turn in 1943 when he joined the later much celebrated “Popski’s Private Army”. This unusually named unit was more properly known as No 1 Demolition Squadron PPA. It was set up in Cairo in October 1942 by Major Vladimir Peniakoff MC. The unit was run quite informally: there was no saluting and no drill, officers and men messed together, every man was expected to know what to do and get on with it, and there was only one punishment for failure of any kind: to be immediately returned to his former unit. Frank joined PPA in 1943 when it was in Algeria and Tunisia recruiting and training new volunteers from LRDG, SAS, Commandos and Royal Armoured Corps for the fight in Italy, bringing the unit’s size up to about 35 all ranks, with two fighting patorls and a small HQ. 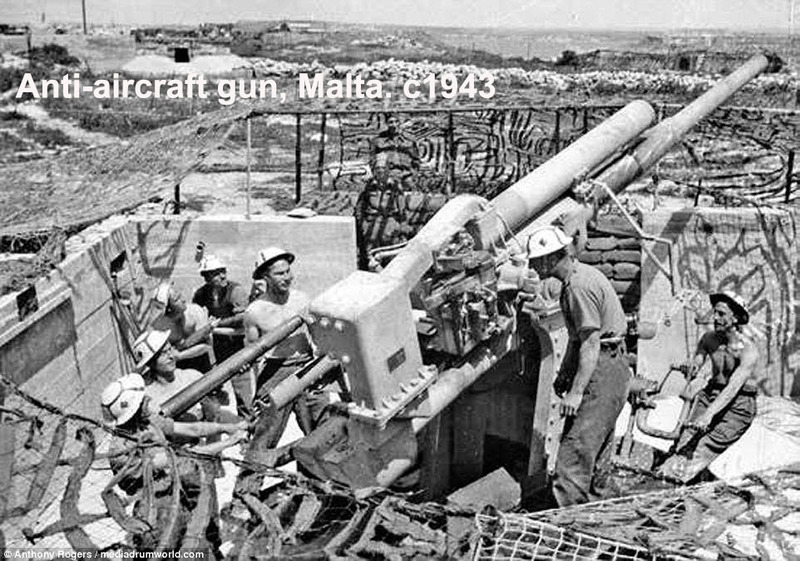 For a short while PPA experimented with using gliders to deliver them and their jeeps behind the lines in Sicily, but their part in that operation was cancelled at the last minute. 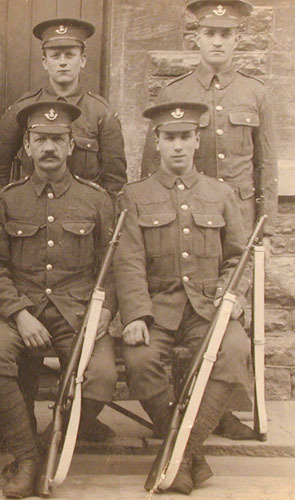 As shown in the credits, Sergeant Frank Riches MM is third from the left. In September 1943, PPA operations transferred to Italy where, after the Italian surrender, the Germans retreating northward were harassed by Italian partisans. PPA patrols co-operated with these groups, using three fighting patrols, each of 18 men in six jeeps. Each jeep was armed with .50 inch and .30 inch machine gunes, giving the patrols immense firepower for their size. Throughout the bitter winter weather and fighting of 1944 and 1945 PPA undertook their operations ahead of regular forces, in support of British, Canadian, Indian and Polish armoured infantry and commando units. They located targets for the Allied Air Force, chased Germans out of rear areas, saved bridges, captured many prisoners and guns and accepted the surrender of the entire German garrison at Choggia. PPA jeep patrol in Italy. The Gargano Peninsula – the spur on the Italian boot – is a blob thirty-five miles by twenty-five, rising to three thousand four hundred feet from the sea on one side and the low Foggia plain on the other. Partly covered with chestnut forests, dissected by precipitious calleys, full of crags, cliffs and gullies, it was a bit of a job for ten men in four jeeps to go and winkle the Germans out of it. There was an idea that strong enemy forces might be entrenched in it – which could have made the position of our troops in Foggia mighty uncomfortable – but Bob Yunnie, Riches, Porter and their men grinned right round their heads when when they left to undertake this formidable assignment, as happy as birds released from their cage. They drove to Manfredonia on the coast, then hairpinned their way up two thousand eight hundred feet to a village called Monte Sant’ Angelo, entirely populated by tall, fair, blue-eyed Albanians, the Germans just pulling out on the other side. 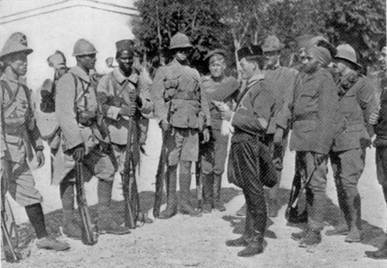 Here they started their inquiries: with them was Gin Missiora (battle name Mifsu), an Italian anti-fascist captured in Abyssinia and now serving with P.P.A., a brave man and cunning, who was their go-between with the local population; in those early days no one in that patrol spoke more than a few words of Italian. From crest to crest and village to village they followed on the tail of the Germans, pressing them so hard they couldn’t stop to blow up the crooked road. Right across the lovely mountains, down on to the coast road, past the seaplane base on the lake of Verano, through Sannicandro, Poggio Imperiale and Lerina (in the malarial plain), on to Ripalta Castle, where a golden haired English girl of unearthly beauty gave them a guide to a ford across the Fortore. Here they caught up with a German rearguard of engineers who were setting about to mine the crossing and engaged the battle straight away. 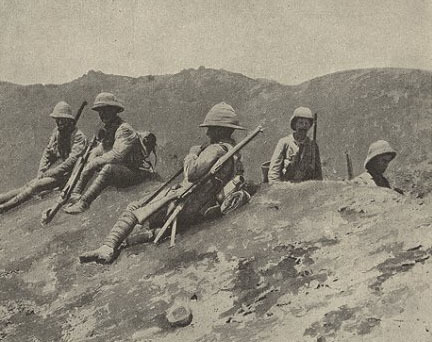 The Germans had a field gun in the hills beyond the river; Yunnie’s four jeeps dodged about to avoid the shells and kept up in the meantime such a fire that the engineers, leaving their dead and their unused mines behind them, withdrew into the hills. Very gingerly Bob Yunnie took his jeep to the river bank and drove it into the water; the flood came over the floorboards but the engine kept running and the jeep pulled up the far bank. The others followed him, up the road to the first rise, where, seeing a staff car approaching, they lay in ambush. They got the car, but the men escaped and must have spread the alarming news: the field gun ceased firing, all went dead and quiet, and darkness coming on, Yunnie recrossed the ford, left two jeeps to watch it, and with the two others retired to Ripalta Castle and its fairy queen for a night’s rest. By the next morning he had got a message back to Jean Caneri in Mola di Bari, who forwarded it again to Fourth Armoured Brigade, that he held a ford on the Fortore. During the following days he skirmished on the north bank of the river and kept the ford clear until our tanks came up from Foggia, crossed the river and fought their way into Serracapriola and on to Termoli. We were coming down the hills into the river valley about a mile and a half from the bridge when a burst of automatic fire came from a farmhouse on the left, my side of the road. Some bullets hit the floor of the jeep between my legs and drew sparks: I wondered how they had got there without first going through me. I stopped the jeep to give Cameron, who was sitting on my right, a chance of answering the fire with his gun, and at the same time I turned round to warn the following trucks. Sergeant Mitchell, who was next to me, opened up, and Sergeant Beautyman, who drove the third truck, did the same. More bursts came from the farmhouse but the half-inch gun on my jeep didn’t fire – surprised I turned towards Cameron to see what stopped him, and found he wasn’t there. I walked round and found him lying on the road, wounded and unconscious, where he had slipped out of his seat. 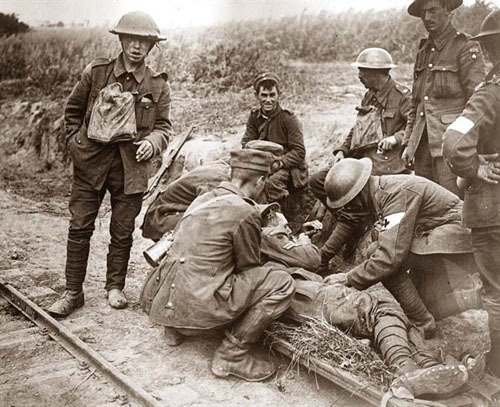 With Sergeant Riches, who had some understanding of first aid, I laid Cameron in the ditch, undid his clothing and began to dress his chest wound by the light of a torch; but he was far gone and after a few rattling gasps he gave a deep sigh and died in my arms. Meanwhile our men had stopped firing from their jeeps, and, led on foot by Beautyman and were apparently clearing it with their tommy guns. A moment later they reported two Germans killed and some others escaped. “You have, I see, another boy waiting to be buried”. “It is my son, Sir, he was with the partisans: the Germans killed him yesterday morning”. He said no more; I fell silent, wondering at the humility of these people who took trouble with our dead and never mentioned their own so much more grevious loss…..I read a short service and said: “I want no other end than Jock has had: a quick death under the sky, with no fuss and no tears, amongst the friends with whom he has toiled for so long. Let us now carry on with our work”. “Amen”, said Sanders and we filled the grave. 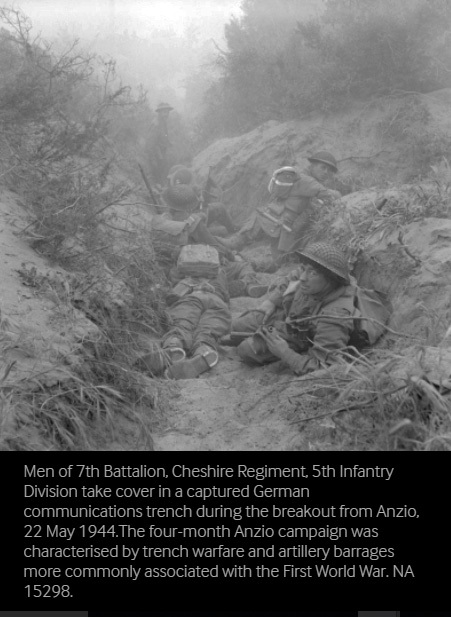 On 17 July 44 at Scheggia, Italy, on his own initiative and complete disregard for his own safety, stayed with his jeep under heavy mortar and shell fire, in a completely exposed position, so as to give covering MG fire to a foot patrol operating ahead of him. He withdrew only after the patrol had returned to safety. Recommendation by Major V. Peniakoff, O.C. 1 Demolition Squadron, P.P.A. Ex serviceman Donald Taylor is once more assiduously selling poppies on behalf of the the British Legion. If you miss him, poppies are also available at the Village Shop. Wallace James Smith, born in 1898, who in 1911 was living with his grandparents, Martha and James Smith, in what was then Great Street. He is described as a Grocer’s Errand Boy. His parents, George Henry and Maria Smith, were both still alive and are buried in the churchyard (he is mentioned on their headstone). A member of the 7th Battalion, the Norfolk Regiment, he was declared missing in action on 30th November 1917 in Flanders during the battle of Cambrai. He is commemorated on the Cambrai Memorial. He was 20. 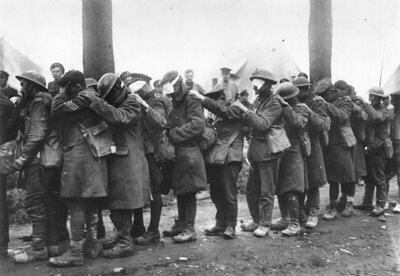 The Cambrai operations from 20th November to 30th December 1917 comprised a British attack, originally conceived as a very large scale raid, that employed new artillery techniques and massed tanks. 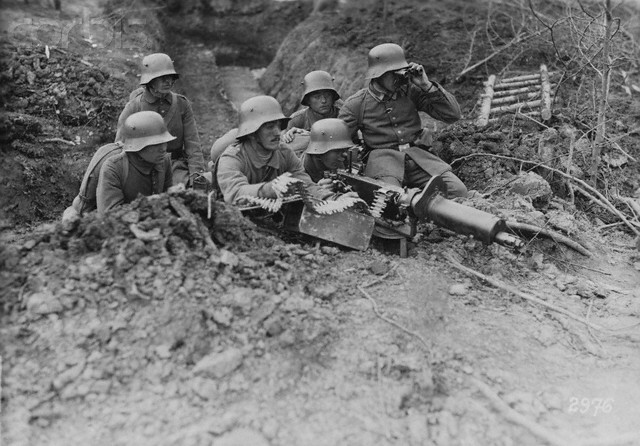 Initially it was very successful, with large gains of ground being made, but German reserves brought the advance to a halt. 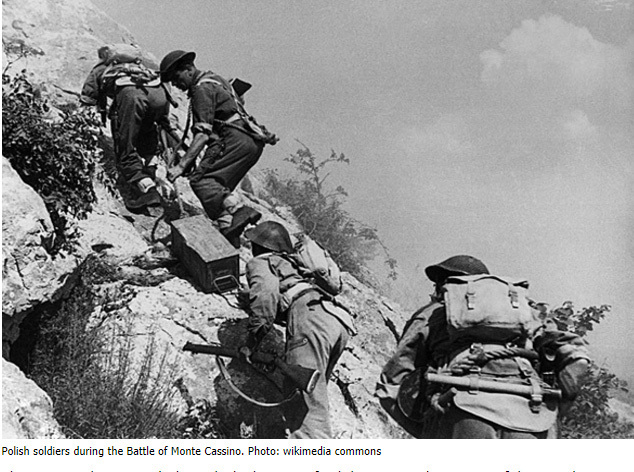 Ten days later, a counter-attack regained much of the ground. Ultimately a disappointing and costly outcome, Cambrai is now seen by historians as the blueprint for the successful “Hundred Days” offensives of 1918. British tank of the type used in large numbers at Cambrai. J R Tyrell was the second son of Thomas Rubin and Emma Tyrrell of Little Street, Sulgrave. Born in 1897, he was described as a plough boy in the 1911 census. 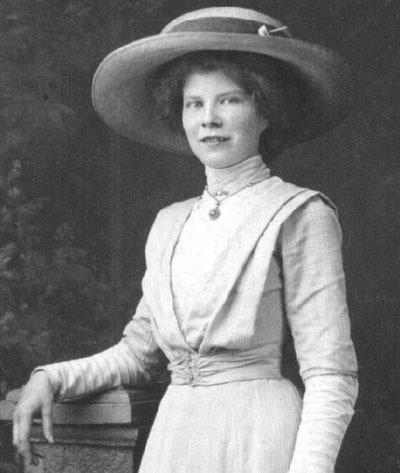 His older sister, Constance, worked for the Whittons (see below) as a domestic servant. He was discharged (presumably wounded) from 2/6th Royal Highlanders (the Black Watch) on 26th February 1916 and died of those wounds) just over a year later in the Spring of 1917, aged 20. It is not recorded where he is buried. George E Whitton, born in 1887 in Wormleighton, the only son of John and Clara Isabel Whitton who in 1911 lived in Sulgrave. John and Isabel also had three daughters. John is described as a farmer. George was a member of the 14th Battalion, the Canadian Infantry (No. 63928). He died on 23rd May 1915, aged 29, and is buried in the Choques Military Cemetery in the Pas de Calais in France. 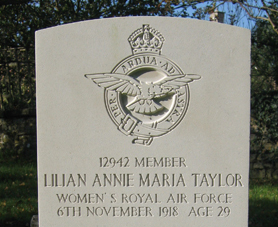 At the time of his death (or, at any rate, the erection of the headstone) his parents lived in Warwick Road, Banbury. It seems likely that he was killed in the Battle of Festubert (15 – 25 May 1915). 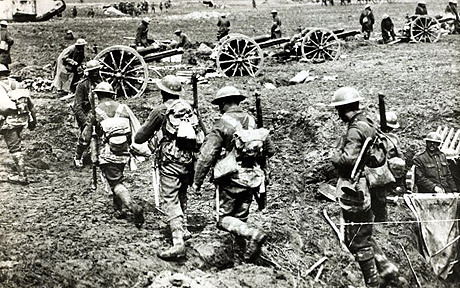 On 18 May, the First Canadian Division attacked but made little progress in the face of German artillery fire. 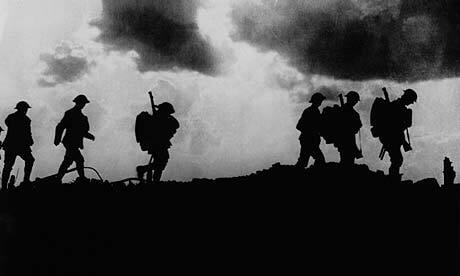 The British forces dug in at the new front line in heavy rain.The Germans brought up reinforcements. 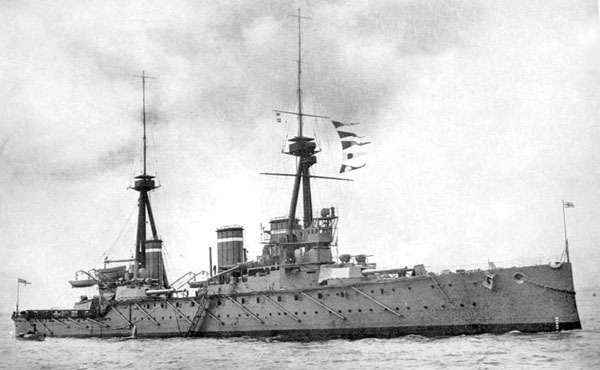 From 20 to 25 May the attack was resumed and Festubert was captured. The offensive had resulted in a 3 kilometres advance at a cost of 2204 Canadians killed, including George Whitton. Click here for more on this atrocity. I am indebted to Ian Salisbury for the information in respect of W. Smith, J.R.Tyrell or G.E.Whitton. When the names are solemnly read out at the Remembrance Service and the two minutes silence follows, perhaps something of the courage, hardships and final sacrifice of these eighteen young men and women will pass through our minds. 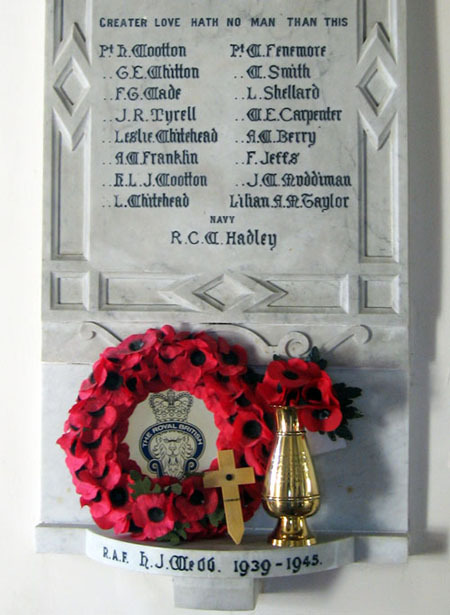 Those unable to attend the service might perhaps give them a thought during the two minutes silence at 11.00 am on November 11th, wherever they happen to be. This entry was posted on Tuesday, November 7th, 2017 at 3:01 pm	and is filed under News. You can follow any responses to this entry through the RSS 2.0 feed. You can leave a response, or trackback from your own site. What an absolutely terrific article. The research and detail is incredible but the thought provoking element of your piece is the personal connection that you have shared. Your recollection of villagers who survived the horrors of war and frequented the Star in the 1960’s goes to show that in historical terms the First World War was a relatively recent event. Yes,my sentiments exactly, what a fantastic article about the outstanding bravity of all these young men.note my new email ad Colin,love to receive your monthly newsletter but have not received for many months now.came down to lois weedon for the 2018 remembrance, and meeting many people from previous visits. PETER wootton.